I'm interested in trying out archery, and more specifically with the Recurve bow. This for indoors target archery, with eventually some competition - but that's not the main goal. Now I'm wondering if there's any difference in picking an Olympic or Traditional Recurve with above calculations? Assuming that the above goes for Olympic, and Traditionals being smaller in size? 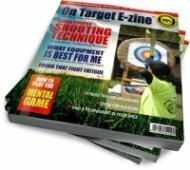 "I also, whether or not correctly, assume that Take-Down-Recurves come in more handy than one-piece-recurves for the sheer fact that you can change the parts to higher or lower draw weight (not?)" 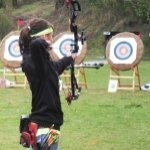 Yes - Take-Down recurve bows allow you to change limb size and draw weight however, you are almost always restricted to the manufacturers and/or model style limbs. With the ILF (International Limb Fixture) system you may use any ILF limb on any ILF riser.